The narcissist in me absolutely must have the latest new tech toys. So, naturally I was among the first to get my grimy little hands on Apple’s new opus: the iPhone 5. And it was my first opportunity (since i missed the last upgrade window) to interact with Siri – who is now my new “other woman”. Not only does she help me manage my calendar and prevent me from texting while driving, but she entertains me and engages with me. She has a sense of humor. She will joke around with me or “sing” me a lullaby If i ask her to. If I say “thank you” she expresses her gratitude for the sentiment. She even catches me off guard sometime with her geek-programmed wit. Animism encompasses the beliefs that there is no separation between the spiritual and physical (or material) world, and souls or spirits exist, not only in humans, but also in all other animals, plants, rocks, geographic features such as mountains or rivers, or other entities of the natural environment. Animism may further attribute souls to abstract concepts such as words, true names, or metaphors in mythology. Examples of Animism can be found in forms of Shinto, Serer, Hinduism, Buddhism, Jainism, Pantheism, Paganism, and Neopaganism. And we have continued to apply the concept of anthropomorphizing (giving human qualities to) non-organic objects as consumerism has evolved. Like with cars. Does your car have a gender? A name? I am willing to bet at least half of you say yes. But unless you are Knight Rider, you are not used to having reciprocated conversations with your car. That is changing, of course. There are now technologies that allow your car to sync to other software and to respond to voice commands with Customer Activation Strategy. Soon everyone will have their own “Kit”. But Siri…well, she’s something different. She’s special. Is she a next step in creating a culture of recluses? Why bother interacting with other humans when you can have a fully capable machine at your beck and call (did anyone else see that episode of Big Bang Theory where the lonely, girlfriend-less Raj starts having a relationship with his iPhone)? It won’t be long until Siri becomes an android and gets to have a physical presence with opposable thumbs” that can do your laundry and make you waffles. We are on our way to becoming the Jetsons…with Robo-maids and flying cars. But they seemed pretty happy and perfectly productive. 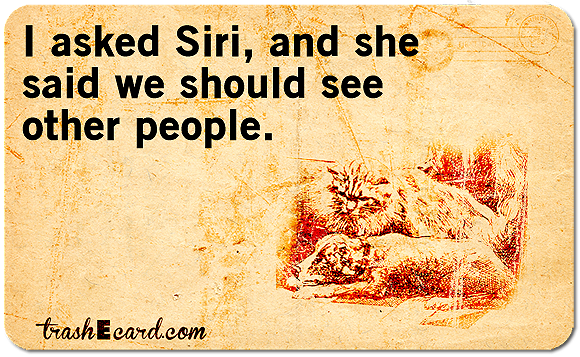 So what do we think will be Siri’s impact on our culture? Do we ourselves evolving or devolving as technology becomes more human? And will we need to change the law to include tech-relationships in the definition of adultery? Speaking of which, I need to text my wife some flowers…. ‹ PreviousHow Do You Rock The Vote? Dress The Part! It seems to me that humans regularly take inanimate objects and integrate them into their cultural lives. This involves granting non-human objects some type of “power”. In animism, the natural world is a major part of a person’s life. Daily interactions with it, both pleasurable and painful produce feelings and emotions. It’s no wonder the material world is granted some type of soul or even perceived as possessing a degree of volition. I would say the same goes for the modern world. It isn’t natural features which are anthropomorphized but technology. And what is it that is a part of our daily lives? When a car refuses to start on a cold morning, making you late for work, you get angry at it. I would argue for the very same circumstance as animism – the seems to be an obstacle, a feature of the world which is obstructing our goals. Siri is just more convincingly human than a rock, a boat, or a car. I also think there’s another aspect to this interaction whereby objects are used by humans to structure their social and cultural lives. Look at the things which get anthropomorphized. I would suggest than I don’t anthropomorphize a fence unless it plays a significant role in my life (prisoner, security guard, individual living on the Arizona/Mexico border?). Really appreciate the thoughtful reply and the role of anthropomorphizing with regard to objects that connect to our social and cultural lives. Interesting perspective I hadn’t thought abut.